Between 2006 and 08, McFarlane released a few lines of really nice, detailed figures and “box sets”, based on various iconic moments from the show. 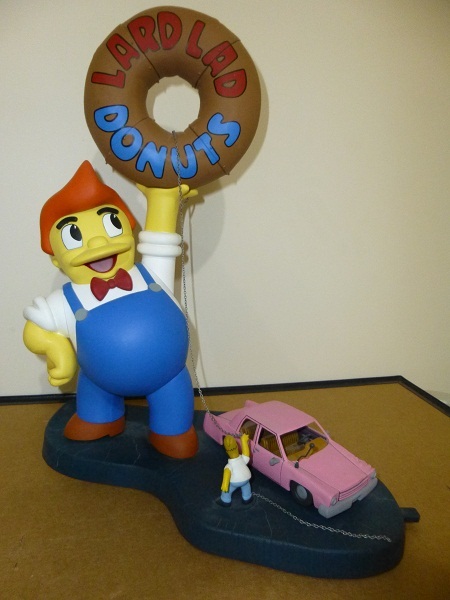 This one depicts the classic scene where Homer steals the Lard Lad statue’s donut, shortly before the town’s advertising mascots come to life, in the Treehouse of Horror IV segment, “Attack of the 50 Foot Eyesores”. A favourite episode of many fans (including myself), this makes for a favourite item of many collectors (including myself). 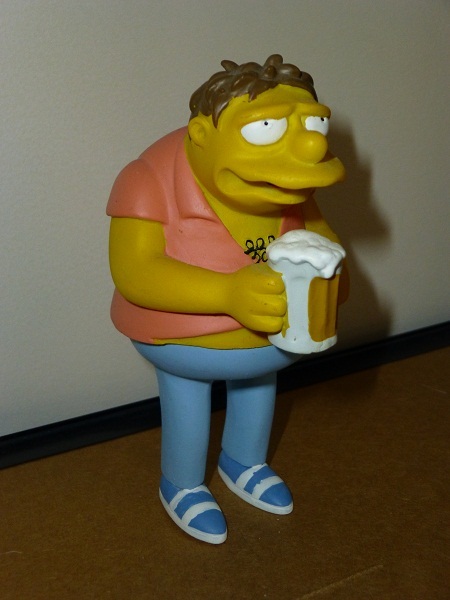 Having a large-scale Lard Lad like this is an attention-grabber, even among the rest of the Simpsons merchandise in the room. 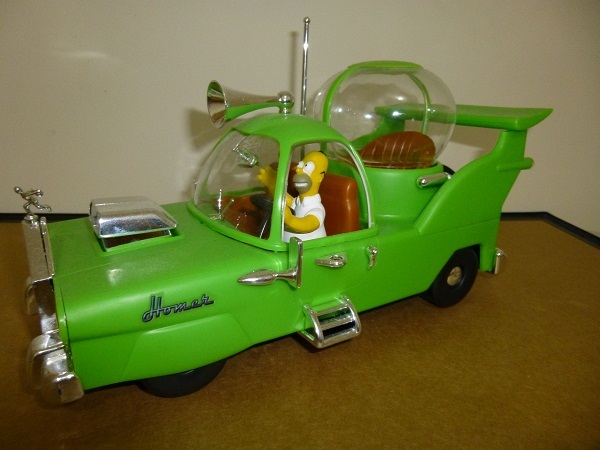 The McFarlane Box Sets, highly detailed recreations of classic scenes from Simpsons episodes, will crop up in a lot of collections, although usually still in the boxes. As I’ve said, I don’t collect boxes, and a series that looks this good deserves to be observed without the plastic covering. This one features Itchy & Scratchy as seen in their cartoon “Spay Anything”, from the fifth season Simpsons episode “Cape Feare”. 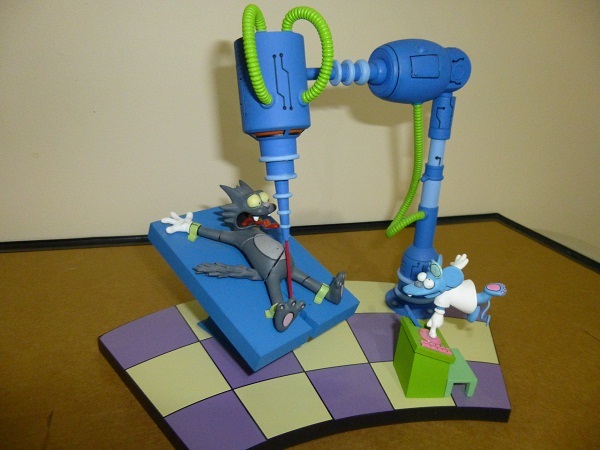 It’s probably the most iconic moment from an Itchy & Scratchy episode that could have been chosen to be immortalized in plastic. 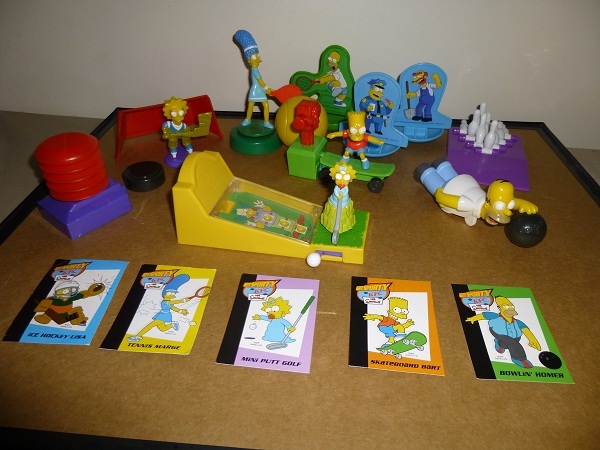 The above photo might look really confusing, but the Get Sporty set, sold in KFC Kid’s Meals in England in 2003, is the best Simpsons kid’s meal toy set I’ve seen from a fast food joint. They’re more games than toys, and are quite well made. 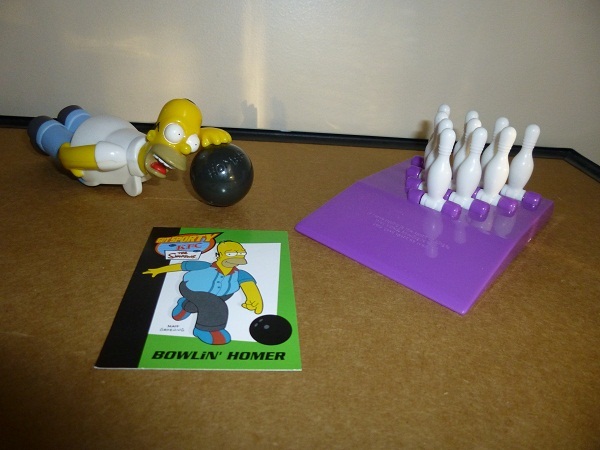 Bowlin’ Homer comes with a Homer figure on wheels, and a pop-up bowling pin display. He’s one of those pull-back cars – aim him at the pins, pull back and release, and see how many you can knock over. 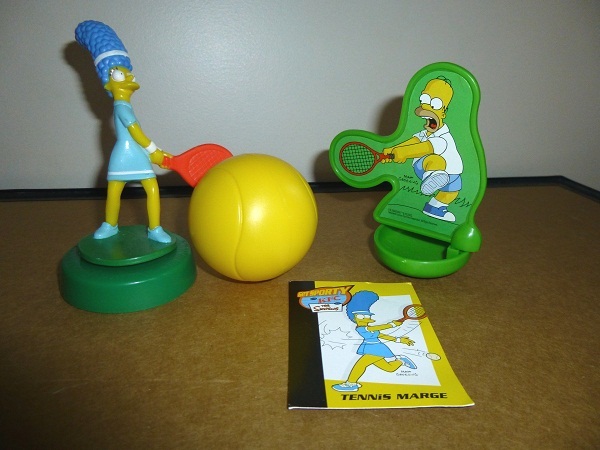 Tennis Marge comes with a Marge figure, an oversized tennis ball and a Homer “plaque” (as the package calls it). There’s a lever on Marge’s base that rotates her and snaps back on release, making her swing the racket to hit the ball to Homer. Being mounted on a round base, Homer will be spun around and have no effect on the ball’s momentum – a snide comment on his tennis skills, perhaps. 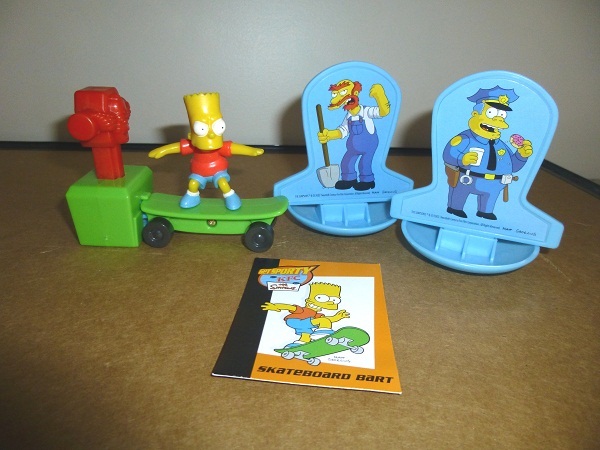 Skateboard Bart comes with a Bart figure on a board, a launcher that looks like a fire hydrant with Krusty’s face on it, and two of the “plaques” (again, their word) featuring Chief Wiggum and Groundskeeper Willie (why not Principal Skinner?). Push down on the Krusty hydrant thingy and Bart will fly off, spinning Wiggum and Willie. 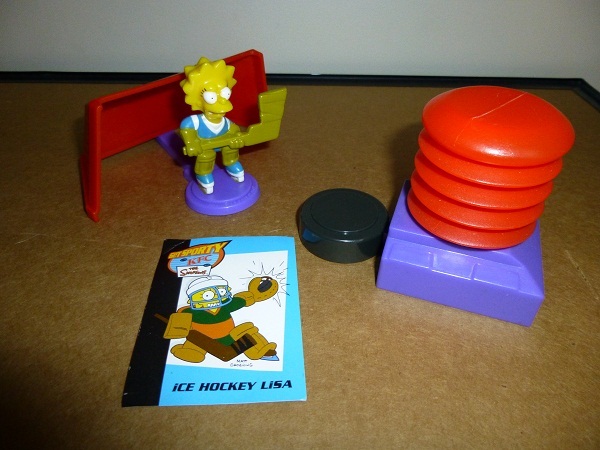 Reprising her role as goalie from the Lisa On Ice episode, Ice Hockey Lisa comes with a Lisa figure, a goal net, a puck and an air pump. Lisa can be slid side to side with that purple stick, as she defends the goal from the puck, launched by pushing on the air pump. 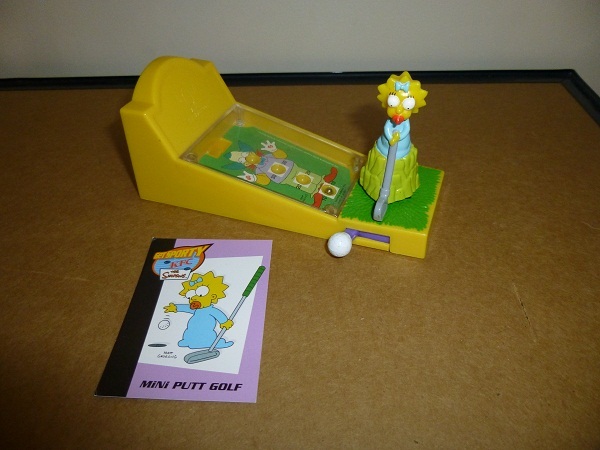 Mini Golf Maggie is one of those classic “pinball” toys: the lever on the left side there flicks the little ball inside, as players aim to land it in the highest scoring section of the Krusty image. They might not look like it, but these are vehicles. Apparently. From the aggressive-sounding PLAY! Inc, this is a set of die-cast vehicles, similar to Hot Wheels and Matchbox cars. As nice as they are, there’s a few weird things about the set. Firstly, that’s some odd vehicle choices, there. 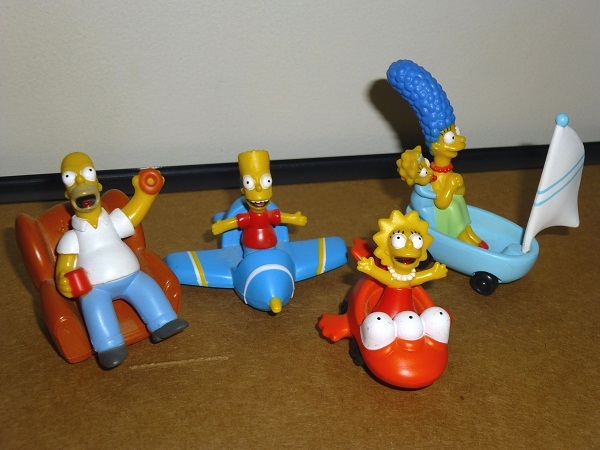 According to the product description, they’re named “Lisa’s Screamin’ Fish”; Bart’s “Never Eat Before Flying” plane; Homer’s “Woo-hoo!” Armchair, and Marge ‘n’ Maggie’s “All in the Same Boat”. Okay then. And what do they have to do with Krusty World? What even is Krusty World? But hey, these are cool. 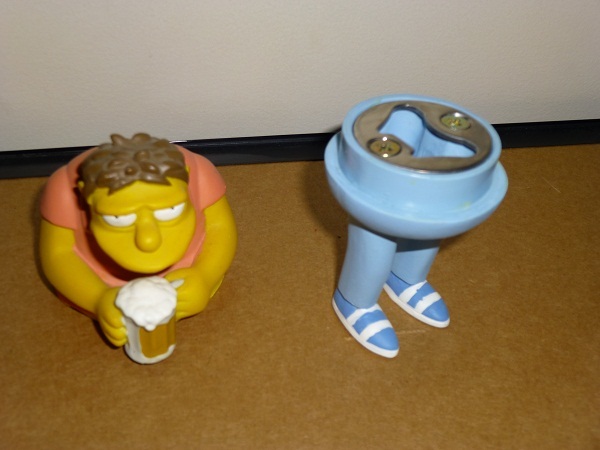 The Barney Bottle Opener is from a fantastic line of decorative barware from Unique Concepts. Each statuette is finely detailed and looks great by itself, but the hidden use only makes it more appealing. They appear to be handpainted, and are made from a sturdy material. Polyresin maybe? I dunno, I’m just guessing. 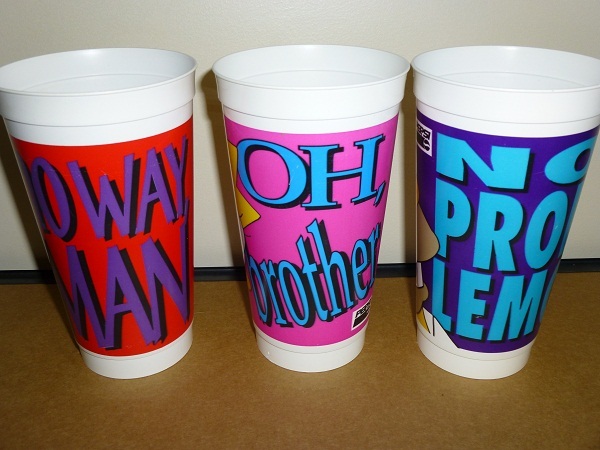 This set of plastic cups were sold at KFC stores in Canada only. They each have a close up of a character’s face, with a vaguely-character-related phrase on the back. Apparently it’s a set of four, but I can’t find any images of them anywhere. 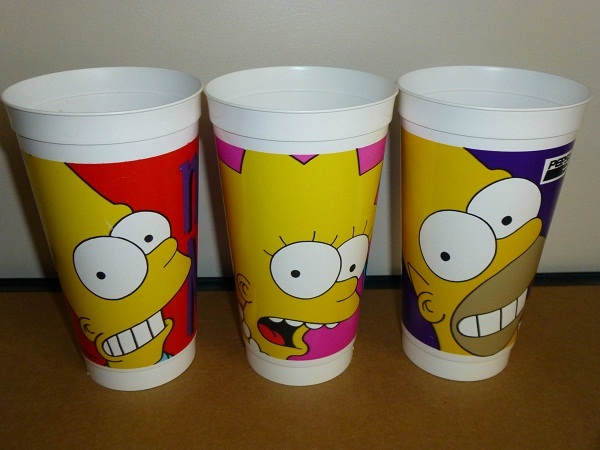 My guess is the fourth cup would feature Marge and may or may not include Maggie – in these sorts of things Maggie is often relegated to featuring alongside another family member, rather than having her own item.